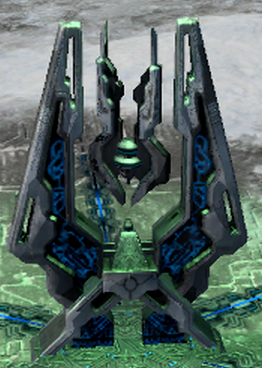 The Forerunner Spire of Healing is a Forerunner structure that heals units in Halo Wars. The Spire is quite similar to a beam emitter, with a central firing mechanism, but with a circular mark on the ground it is stationed on. When approached by wounded or damaged units, the Spire discharges a beam while the ground circular mark brightens, healing the said units. Its healing powers is of unknown origin. The Forerunner Spire of Healing is available in the Skirmish maps Frozen Valley and Barrens. It is recommended for the player to secure the structure at the beginning of the level. If secured, it will ease the player's need of new units as the structure will constantly heal the unit if attacked. Additionally, it will also save a UNSC leader's Heal and Repair power, and the need to create an Engineer. It may be related to the Regenerator, due to their similar design and function, along with the Regenerator's possible Forerunner origins. Concept art of the Spire for Halo Wars. A Spire of Healing in Halo Wars 2.